Giveaway Alert for 3 winners! Bodyguard Chase Rider isn't thrilled to be back in the town where he spent his childhood summers. His beloved grandmother passed away, leaving him a house in need of major repairs. With a three-week timetable and a lot to do, he doesn't have time for distractions. Then he bumps into Julie, the one woman he hoped never to see again. Chase tries to pretend Julie doesn't exist, but ten years hasn't diminished his attraction to the hazel-eyed stunner. When a stranger grabs Julie's arm at the grocery store--a woman who insists Julie's life isn't what it seems, Chase can't help but get involved. Julie and Chase dig into a twenty-five-year-old mystery, unearthing more questions than answers. But the past is closer than they realize, and the consequences of the truth have the potential to be deadly. “I’m a pretty lucky girl; one day I woke up and my entire life changed. I saw the light, so to speak, and decided I was going to be a writer. Now, five years later, I’m working on my tenth novel! I’m remain so very grateful for the support and success that I have had. Thank you!” - Cate. 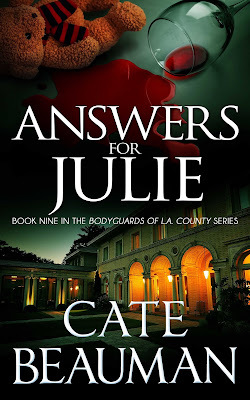 Cate will be giving away 3 Kindle or Nook copies of ANSWERS FOR JULIE to one lucky person leaving a comment or email entry. Cate Beauman is one of my favorite authors. I usually one click her books at one minute after midnight (or as soon as I can when they are available). 😉. I encourage everyone to read just one of her books, you will be hooked! Don't enter my name in the contest ... I have ALL her books on my kindle. Book nine already, I have a lot of fabulous reading ahead of me. I haven't read any but they look great!! Guess my weekend will start withn book 1. Thanks for the chance. congrats to Cait on the new release!!! thanks for sharing! Hi Care, Congratulations! And, your covers are very colorful. Congrats on this latest release! Love the Bodyguards of L.A. County - congratulations on your new release! Congratulations on your new release. I love the Bodyguards of L.A. County series! Thanks for the chance. Wow! 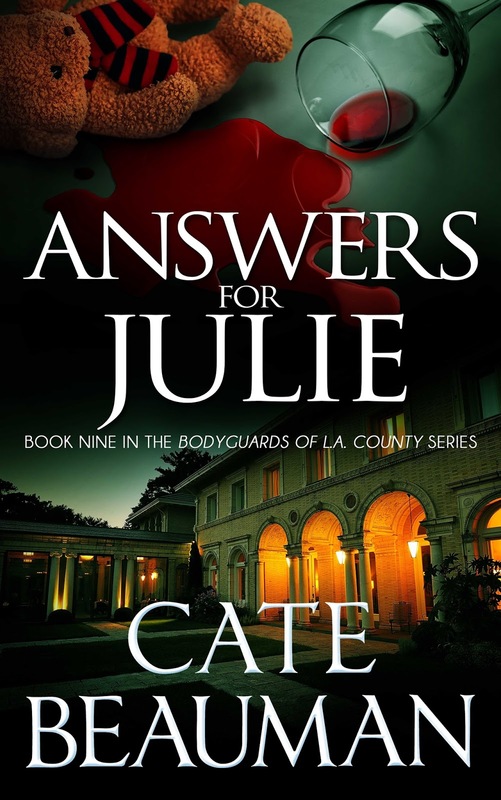 The synopsis for Answers for Julie sounds great and made it a must read for me. I HAVE to find out what the mystery is and how Julie and Chase work things out with it.